Right now, Venezuela is experiencing many of the same political battles as Brazil just went through with the election of conservative Jair Bolsonaro as president. President Bolsonaro won a stunning victory in Brazil over the Workers’ Party candidate who promised to continue the failed socialist policies that had driven the Brazilian economy into a ditch leading to massive corruption and crime over the past 15 years. Reuters reported after the victory that “It was the first presidential loss since 2002 for the leftist Workers’ Party, which was hobbled by corruption scandals in 2016. Bolsonaro’s conservative Social Liberal Party (PSL) has tapped into Brazilians’ frustration with high unemployment, soaring murder rates and political corruption.” The same battle is going on in Venezuela today after a contested election. Newly sworn in President Nicolas Maduro is under fire as opposition has mounted with the U.S., Brazil, Columbia and other nations’ act of recognizing Juan Guaido as the president of Venezuela. With the current struggle for power in Venezuela and a highly contested election, it is important for the U.S. to continue to economically engage in Venezuela no matter who wins that internal battle, because economic engagement in that country will sideline America’s adversaries, including Russia and China, from establishing a strong economic, and military, presence in South America. Keeping a vibrant private sector influence in South America will both help with economic progress for the people and to sideline traditional rivals. An agreement between an American company, EREPLA, and a state-owned Venezuelan oil company is in the crosshairs right now, because many hard liners in the United States have chosen economic isolationism towards that nation as a means to starve cash from the Venezuelan government. The U.S. Treasury Department’s Office of Foreign Asset Control is looking at the deal and it seems consistent with the America First economic policies of President Donald J. Trump and Treasury Secretary Steven Mnuchin, therefore logically should be approved. The fact of the matter is that creating an economic vacuum will allow Russia and China to dominate economic relations with left leaning governments in South and Central America in a way that will hurt American national security. America’s enemies are taking advantage of the U.S.’s lack of presence in South America to establish closer military and economic ties to nations close to the U.S. Russia is strengthening military and economic interactions with Venezuela by accumulating assets and establishing very strong political ties to the Maduro regime. In December of last year, the Russians sent two nuclear bombers to Venezuela that will present a real threat to the continental U.S. The Aviationist reported on December 11, 2018, “The two massive Tu-160 ‘White Swan’ bombers arrived at Simón Bolívar International Airport outside Caracas on Monday following a 10,000-kilometer (6,200-mile) flight across the Atlantic from Engels 2 Air Base, 14 kilometers (8.7 mi) east of Saratov, Russia. The aircraft belong to Russia’s elite 121st Guards Heavy Bomber Aviation Regiment, the only unit to operate the approximately 11 operational Tu-160 aircraft of 17 reported total airframes from 6950thAir ForceBase.” A strategy of economically cutting and running from Venezuela will help Russia’s military goals. 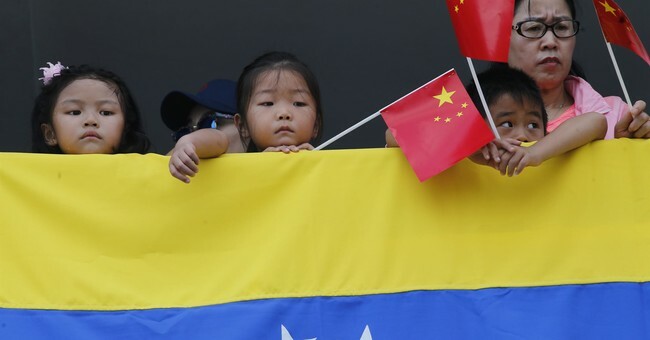 China is also working to get a strategic and economic foothold in South America based from Venezuela. Reuters reported on December 13, 2018, “A Venezuelan oil joint venture with a state-owned Chinese company accounting for around 10 percent of the crisis-stricken OPEC member country’s output has nearly doubled production in the past seven months, a unit of state-owned PDVSA said on Thursday.” China is a Venezuelan creditor since 2008 and they are using loans and deals to get control of Venezuelan oil with this deal accounting for 10% of all the nation’s oil output. The U.S. company, EREPLA, could be considered an economic ambassador to the region and a way for economic engagement to help get that nation to view the United States in a more favorable light. The company will control the cash flow from oil sales in a way that will protect U.S. investors from that government seizing assets before they can get back to the U.S. This is a great way for the United States to expand economic interests in South America, because U.S. companies are a more efficient and better allocator of resources to the government run and inefficient enterprises coming from China and Russia. This is a great way for economic engagement that will lead to better oil access for U.S. consumers and economic engagement that will box out Russian and Chinese interests who would love to kick aside American influence in the Western Hemisphere. This deal should be allowed to move forward to aid U.S. economic, and national, security in the region. Maduro has worked towards a close relationship with China and Russia, yet the state-owned oil company recognized that an American company has better capabilities to extract oil. U.S. interests in the region need to be preserved – especially during this time of political turmoil over control of the government. Bottom line is that this deal increases national security and will show that economic isolationism is a failed model to force changes on other nations.